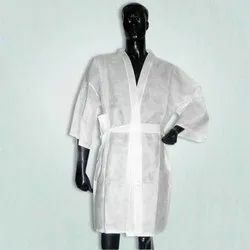 Catering to the demands of the customers, we are engaged in manufacturing and supplying a wide range of Disposable Bathrobe.Manufactured using high grade disposable fabric and material and latest technologies, these bathrobes provide complete comfort to the users. In order to conquer enormous level of patron belief, we have been engrossed in offering high quality of Disposable Bathrobe in the market. Suitable for massages, hotels, aroma oil massages, panchkarma massages, kerala massages, unisex salons, beauty parlours, hospitals. Good quality non woven cotton compressed material, good oil and water absorbant. Our disposable bathrobe is made of non-woven fabric, to keep warm and comfortable perfect for hotels, spas and saunas, it's now available to all our customers at an unbeatable price.No more expensive laundering with escalating energy prices.